Lovely Oceanfront 3rd floor 2bd/2bth Beautifully maintained unit in Kona Bali Kai, one of Kona's most popular oceanfront destinations. 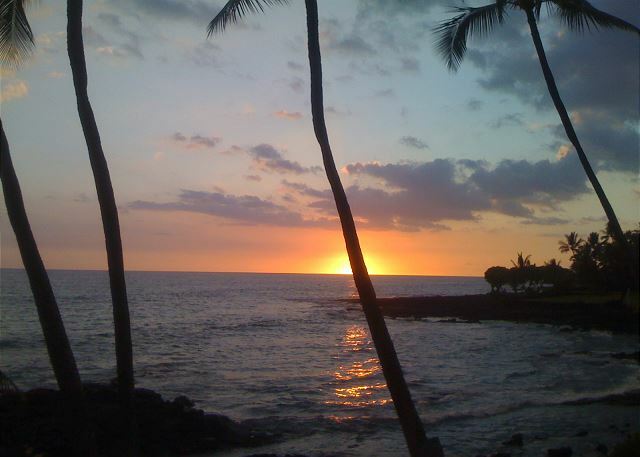 Watch the dolphins, whales (during winter season) surfers, and those magnificent Kona Sunsets right from your own private lanai. Large pool and hot tub in center of complex, sandy beach areas and oceanfront BBQ with picnic tables just steps from your unit. There is covered parking and elevators for easy access. Located approximately 3 miles from Kona, less than a mile from White Sands Beach, and about 2 miles to Kahaluu Beach Park for some of the Islands best snorkeling. You are also just minutes away from shopping, restaurants, and ocean activities. Unit 317 at the Kona Bali Kai was all we had hoped for ...great location, well-stocked, well-appointed and clean. A plumbing problem was dealt with immediately. We would not hesitate to stay there again. This condo and the view is so beautiful. Convenient location and everything you need to enjoy your stay. Very clean and comfortable. The kitchen has been nicely remodeled and the furniture was very comfortable. We loved seeing the turtles in the lava pool every morning. The master bedroom bed was very comfortable. We loved listening to the crashing waves as we slept. Spent a lot of time on the lanai watching the surfers. We had a very comfortable and pleasant stay here. We were very happy with our choice. I would recommend this condo to others and would stay here again if we return. A great ever changing view is had of the beach and waters from a very nice apartment. The rental was well stocked with the everyday needs of a home away from home. Major attractions and points of interest are within an easy drive of the rental. My family and I enjoyed our stay at this property. The space was perfect for two adults and our two teenagers. The kitchen was fully stocked, there were great beach supplies (chairs, bags, umbrellas, coolers, and boogie boards). I HIGHLY recommend this property. The rental is in a great location. Awesome views. Short drive to very good beach. Nice pool. Nice seafood restaurant in same location. Great location, close to everything. The condo was just as pictured, just above a little sheltered pool in which we saw Turtles Daily. Management company is not on-site. We arrived a couple hours early, and could not get in. The lock is time activated and we did not ask for early check in. Management did not answer calls until after our check in time passed and we had already gotten in. That was the only hiccup in the trip. The breeze and ceiling fans adequately compensated for no A/C. We were very satisfied with our selection of this property for our stay. Very nice place, ocean front. Close to all activities. Overall the complex very well kept, and quiet. Condo is clean comfortable. This condo is older but is clean & well equipped. The highlight for us was the lanai we watched the sunset every night. We really enjoyed the lounge chairs & it also had a table & chairs so we spent all of our time on the lanai. The bedroom patio doors opened up to the lanai so we could hear the waves all night. The pool was clean & they had security also. Great condo but no direct access to the beach. 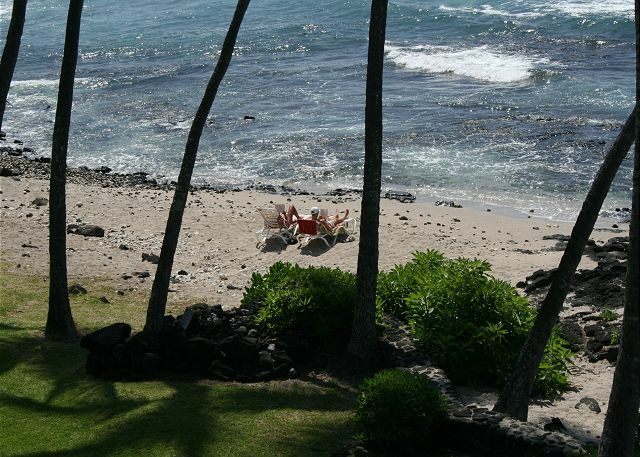 Exceptional View , wake up to turtles in the tide pool daily. Our first trip to the Big Island and my mom's (82 years old) first to Hawaii. We wanted to enjoy a condo right on the water and we truly loved it. Every morning we would see turtles in the tide pool directly off the lanai. There is a sandy beach adjoining it and we were pleased to see turtles on the beach several afternoons. A popular surfers beach is at the south end of the complex and we enjoyed watching surfers ( up to 10 plus) everyday of our stay. The condo has two separate bedrooms and two washrooms. Bus stops directly at the condo complex ( both directions). The property management was excellent and catered to any concerns that we had. We truly enjoyed our stay and would recommend it to everyone. Thank you for an enjoyable stay. We had a very nice stay at the Kona Bali Kai unit 317 in April 2017. It's a 2 bedroom condo approx. 5 minutes drive from the center of Kailua (Kona). I believe it has a max. occupancy or 4 persons as the wicker sofa in the living room is not a pull-out bed. The master bedroom facing the ocean is excellent, with full on ocean sounds and views 24-7, but the second bedroom which has windows that face busy Ali'i Drive, is quite noisy with traffic sounds from 5am until 11pm at night and could be quite a problem if a person is a light sleeper. The noise would probably not disturb a child as most children sleep pretty soundly, but I found it quite a distraction. I thought that the double sized beds in both bedrooms a little small as most couples are accustomed to a larger size bed these days. This unit is a little dated, but clean and well cared for. The kitchen appears to be original as well as the stove and fridge, but everything works and has been kept clean. The kitchen is fairly well equipped. We spent most of our time out and about, but when we were in the condo we were on the lanai. The lanai is large and the view is outstanding, so naturally we ate our meals out there and read and relaxed in the afternoon sun. There's a popular surfing spot just to the side of the condo called Banyan Park, and there are surfers playing daily in the waves for our entertainment! The tide pools on the oceanfront side of the building have at least 5 different sea turtles feeding all day, so it was a joy to see them so close. This unit doesn't have Netflix or similar, but we did use the wifi successfully. We also enjoyed swimming in the pool in the evenings. The pool is rarely busy and often you'll have it all to yourself. All in all, we enjoyed our stay in 317....queen sized beds would have made our stay much more comfortable tho'. Just wanted to address two issues from this review. The bed in the master bedroom is a queen. The unit is set back from the street and if the windows are kept closed there should be minimal road noise. This is the only complaint received about road noise from the second bedroom. That being said I wish to thank the guests for writing what I feel is a fair and honest review. Aloha, Mgmt. Great spot with amazing views and ocean sound. This is the third time my wife and I have stayed here (at Kona Bali Ki, not unit 317). This is our first time with kids, and in unit 317, previous time was about 2008 before we had kids. We love this place. In most of what I read about Kona Bali Kai, the vast majority of people that are disappointed in their stay book through the Kona Bali Kai itself and sometimes don't get the location they paid for or were promised. In this particular case, rest easy because if you are booking here, you know you're getting unti 317! If you are expecting a posh resort, where you lounge on the beach all day, look elsewhere. If you are looking where you can get million dollar views on a budget, this is a winner. Interior could use some updating, but it's not a huge deal. There's not exactly a ton of places where you can get this location and view for under $200 a night. Millers surf shop on site is great to rent snorkel gear and Da Poke Shop, also located on site has amazing poke, some of the best to be had on the island. Stayed in this condo for 28 nights. Wonderful location and view, all appliances and plumbing worked as they should, clean and pleasant. The condo was cool enough with sliders open and fans on. Had seen earlier reviews saying the mattress was like sleeping on rocks. We saw no problem at all with the bed so maybe it had been replaced or our opinion was different. Overall, for the price, we would stay again. On the negative side and nothing against the condo itself, but the smokers (and there seem to be many) like to light up right in front of the unit. The smoke drifts up and onto the lanai. We slept with the slider open to the ocean every night and waking at 0630 to the smell of cigarette smoke coming in the room does not mix well with the sound of the waves and birds welcoming a new day. I talked to security about the concern. Security said they talk to the people when seen smoking and tell them of the designated smoking area at the end of the complex, but are usually ignored. Maybe posting something in the area would help, but who wants to spoil such a beautiful view with a NO SMOKING sign. The location could not have been better. Our major complaint was the the mattress. The mattress was way too soft. It made getting a good night sleep quite difficult. The condo was clean but could use a bit of remodeling and upgrading. The few minor things that needed fixing were taken care of quickly and professionly. Would stay here again. Minor facial tissues and 1 hand sized bar of soap in bathroom. We spent a lot of time on the lanai relaxing and watching the turtles, the waves, and the local surfers. The unit was older but homey ans fitted out with extras like snorkel gear and detergent. We liked the Poke Shack downstairs and the nearby small grocery. 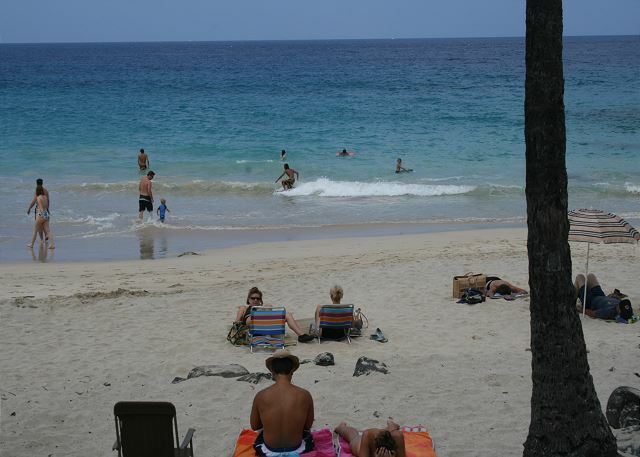 The location was close to several beach parks and the Keauhou shopping centre. The pool was refreshing, the WiFi was fast, and the overall impression was relaxed and hassle-free. One suggestion: provide a small booklet of condo tips and local interest stops for renters' information. Mark F from Spokane, WA does not recommend this vacation rental. I LOVED Kona Bali Kai and plan on coming again. It was amazing to fall asleep and wake up every morning to the sounds of the ocean. I could view the sunset from the lanai and were greeted with sea turtles every morning. Pros-further down than the tourist trap, private lanai, ocean views, adequate parking, friendly staff. Cons-I assume due to salt damage...sliding doors hard to open and shut, TV connections worn (yes we actually did attempt to watch a movie), washer lock made it hard to get our clothes out, snorkeling set doesn't work so buy/rent your own. Honestly, there were so many positives that those little inconveniences didn't even matter. I'd rent this place again in a heartbeat! Needs more storage for clothes. Other wise the unit has it all. The oceanfront view from the lanai is amazing. The condo is a couple miles from the main town area so you're far enough away, but close enough to drive or take a cab in if you want to enjoy a night out. It was convenient to have Da Poke Shack downstairs as we enjoyed a couple meals from there. The bed in the master bedroom was a bit firm for my liking and the furniture is a bit dated, but those would be my only very minor complaints. We enjoyed our stay but the TV in the common area is tragic, we didn't get all the channels and had to watch football in the bedrooms. we moved one of the tables and the amount of dirt under it was gross. The Poke Shack was a definite bonus. Can hardly get closer to the ocean than this!